From Kenny Powers: “Re: the all-new Allscripts Avenel EHR. I haven’t heard anything about it since it was announced in March. Is it being sold yet?” I haven’t heard a peep since the buzzword-heavy announcement seven months ago. The product isn’t listed on the company’s EHR page and Googling turns up nothing. It wasn’t mentioned in the company’s August earnings call. Allscripts said it’s being used by Carlinville Area Hospital (IL), which didn’t respond to my inquiry. It doesn’t matter whether the seemingly undesirable change is your fault or the company’s. Your self-worth or identity is not defined by what you do for money and the people you worked for or with are not your real friends. You are a vendor (of your own services) who lost a key account and life goes on. Always be managing your career and your network so you aren’t caught off guard when you need to make a change quickly (OK, I’ve never done that, but I wish I had when the layoff axe began swinging and we were all scrambling simultaneously hoping to find local jobs with similar skill sets). Never stop learning, even if on your own (cue my pitch for reading HIStalk as well as my original incentive for writing it). The dotted lines of your career changes make sense only after the fact, when the pattern becomes clear. You never know where you’ll end up or how to get there. Serendipity is often your friend. 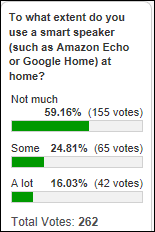 Most poll respondents aren’t heavy users of smart speakers at home. The most common uses are setting hands-free timers, playing music or mood sounds, keeping shopping lists, checking the weather, and controlling smart plugs to turn specific items on and off. There’s apparently also an intercom feature on Echos that I didn’t know about and some folks play games on their devices. New poll to your right or here: for those whose company, more than five years ago, terminated you, demoted you, or forced you to move — did that turn out to be positive overall? Thanks to these companies that recently supported HIStalk. Click a few logos to learn more about companies you don’t know much about and to thank them for making what I do possible. I didn’t realize what a mess I’d gotten into when a friend asked for help buying a replacement set of wired earbuds for her Phone 7, a shining example of Apple’s recent cluelessness and crappy accessory quality. That model eliminated the headphone jack for no user-benefitting reason; Apple’s Earpods (as well as the Lightning-to-3.5mm connector) are pure junk that last weeks at best, according to reviews; you can’t listen and charge simultaneously; and because of the market opportunity offered by Apple’s misstep, every product listing on Amazon is obviously fake since the reviews don’t match the product. Bluetooth is an option, but it’s pain having to charge earbuds as well as the phone itself. I finally gave up and spent $30 on the EarPods from Best Buy plus $10 for the converter cable since I was getting free shipping anyway, so at least the option is there to ditch Apple’s earbuds in favor of decent ones, at least for the few days the converter cable is likely to last before falling apart. Gastroenterology EHR vendor GMed, acquired in mid-2015 by Modernizing Medicine, renames itself to Modernizing Medicine Gastroenterology. Hackensack Meridian Health (NJ) implements Vocera Rounds at JFK Medical Center, the health system’s 10th deployed hospital. Berkshire Health Systems selects Santa Rosa Consulting to lead its Meditech Expanse implementation. Tim Knoll (Healthgrades) joins PatientSafe Solutions as regional VP. 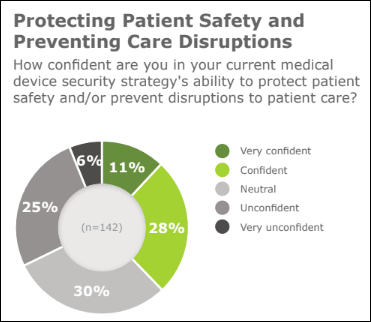 A KLAS report on medical device security — created with CHIME and its security group AEHIS — finds that few CIOs and CISOs are confident that those devices are protected, mostly because of poor manufacturer support or due to their own lack of a device inventory. The confident respondents give credit to good policies and procedures, strong technology, and interdepartmental collaboration, although it’s anybody’s guess as to whether they are truly more secure rather than naive. Respondents say it’s tough to protect legacy devices due to outdated operating systems, lack of patching capability due to technology limitations or warranty policy, hardcoded passwords, and lack of encryption. They also say manufacturers use FDA policies as their excuse for not patching their devices, yet FDA rarely holds the device-makers responsible when their systems are breached. 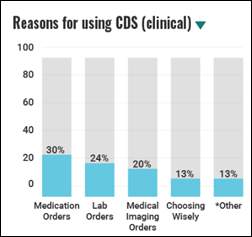 A new Reaction Data report on clinical decision support finds that 55 percent of mostly hospital-based respondents use multiple CDS solutions, with most of those provided by their EHR vendor. 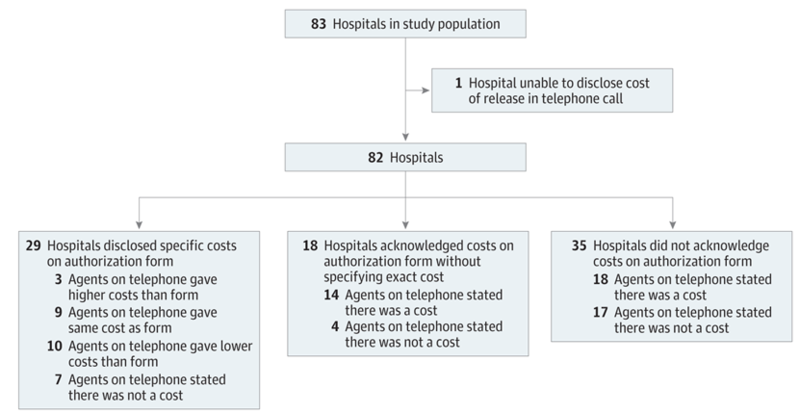 Caveat: I would question the accuracy of the 25 percent of respondents who say their hospital doesn’t use any form of CDS, the non-appearance of Meditech on the list among its EHR competitors, and the inclusion of Allscripts EPSi even though it offers only financial (not clinical) decision support. Non-EHR vendors with the largest presence are Stanson Health and National Decision Support Company. A 2017 study found that the imaging CDS of NDSC, which was acquired by Change Healthcare in January 2018, holds 70 percent of that market. EClinicalWorks will integrate its Healow mobile app with the WellWatch smart watch being developed by UK-based Care UK. The latest Bureau of Labor Statistics employment report finds that healthcare employment increased by 26,000 in September, nearly evenly split between hospitals and ambulatory services. Healthcare employment has increased by 302,000 in the past year. In other words, we’re turning the entire country into one giant hospital and then complaining that insurance costs too much and our taxes are too high. 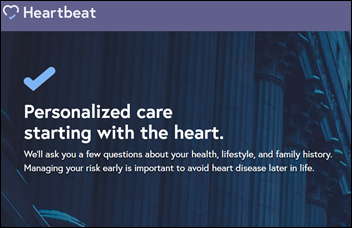 CNBC profiles Heartbeat, a cardiology practice startup that is opening offices in New York City that will offer online tests, virtual care, and treatment plans that include exercise and nutrition components. The “fully digitized boutique cardiology practice” accepts Medicare, commercial insurance, and cash ($200 for a visit or $299 for an annual membership). Aprima sales executive Lance Allen donates a kidney to allow his peer Mike Alfieri — who he met two years ago at a company sales meeting — to receive a transplant in a 13-person paired exchange. Just in case watching a single shark jumping isn’t enough, BlackBerry (are they still in business, and if so, why?) announces a blockchain solution for health data storage, an operating system for secure medical devices, and a skin cancer data sharing service for researchers. The company has chased healthcare tech fads before — I haven’t heard a thing about BlackBerry’s work with (and investment in) NantHealth in early 2014. The Montivideo, MN paper apparently confused the local hospital’s incumbent vendor (Meditech) with its new one (Epic). I assume it’s a Community Connect implementation at a price of just $1.5 million. It’s also odd that the hospital says its existing system is “outdated” when it was supposed to have upgraded to Meditech 6.1, although maybe that never happened. Liaison Technologies will accept applications for its $5,000 Spring Semester 2019 Data-Inspired Future Scholarship through October 31. LiveProcess will exhibit at the Iowa Hospital Association Annual Meeting 2019 October 9-11 in Des Moines. Vyne Medical, Experian Health, The SSI Group, Surescripts, and National Decision Support Co. will exhibit at the Cerner Health Conference October 8-11 in Kansas City, MO. Netsmart will exhibit at the Michigan Premier Public Health Conference October 10 in Bay City, MI. Clinical Computer Systems, developer of the Obix Perinatal Data System, will exhibit at the AWHONN conference October 11 in Freeport, ME. TransUnion wins an “Outstanding Company Culture” award from the Illinois Technology Association. TriNetX will exhibit at the MedImmune California Translational Science Forum October 9 in San Francisco. Voalte names Candice Friestad, RN of Avera Health the 2018 Voalte Innovator of the Year. Wellsoft will exhibit at the Urgent Care Association Fall Conference October 12-14 in Houston. @Amatriciana – totally agree with Mr. H about careers. Each time I was shown the door (boss conflict, downsizing, and failed salesmanship), I fell up to a better job, better pay, and more interesting work. Keep the resume ready, network all the time (it’s fun finding out who is where and what they are doing), keep records of your contacts, and keep reading HISTalk! I volunteer at a non-profit job search agency that has over 17 workshops and supplies coaching. If you live in the Chicago area check out: mycareerpplace.org . If you are not in Chicago see if there is something like it in your locale. You could go to an outsource firm but that can cost thousands and their effectiveness is very spotty. 3) Effectively selling your value. Monster.com has some very good articles about all aspects of job search, check’m out. I can’t remember the last time I plugged a pair of headphones in to my iPhone (or any other device for that matter). It was probably on an airplane when I thought Bluetooth wasn’t allowed (it is). If you have an iOS device, I strongly recommend the BeatsX headphones. Pairing is dead simple and they offer really good battery life. They charge with a lightning cable (which you already have for your iOS device) and are infinitely more comfortable than the stock Apple ear buds. Plus they offer great range and sound quality. If you look around, you can find them for under $100. Earbuds dilemma… do you worry about long term hearing loss with all the devices on or in our ears? Seems like a story that will be written in ~20 years about how these weren’t good for us and we should re-think having sound dumped into our ear canals. I do think about that, especially since I like to listen loud and my. preferred music isn’t exactly mellow singer-songwriter melodies. Although perhaps having the music from tightly inserted earbuds transferring directly via conduction might be better than blasting ambiently into your head via speakers (just musing here since I have no idea). It’s hard to believe that not long ago workers in high-noise environments, including musicians blasting sonic waves from massive stacks of on-stage speaker cabinets, didn’t wear hearing protection despite near-constant exposure. 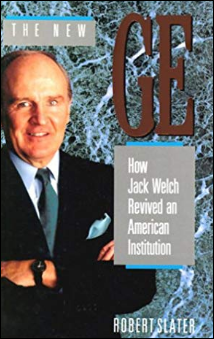 Re: GE…as I noted in the last issue of HISTalk, Jack Welch was basically running a massive hedge fund and jumped ship just as the financial crisis hit. As far as a management guru he did an excellent job managing his PR firm. Not odd to me. Meditech has the oldest technology of any of the HIT major vendors. Therefore you can be on the latest and greatest that Meditech offers and still be outdated. All that is required to see this is to have a healthcare and tech perspective larger than what one particular vendor’s marketing story is. I used to be an AS/400 analyst and that problem was endemic on that platform. It was commonplace that the very latest application versions would look old, inflexible and inadequate when placed next to applications running on other systems. The AS/400 had a different set of strengths and weaknesses as compared to Meditech but the overall story was very similar.